The Ibanez IJRG200 Jumpstart Pack was created to provide beginners with everything they needed to get out and start on the path of becoming a rock legend. The Ibanez IJRG200 Jumpstart Pack was created to provide beginners with everything they needed to get out and start on the path of becoming a rock legend. The Jumpstart Pack takes away the guesswork of knowing what you need to start performing and brings everything together in one ready-to-rock package. The GRG guitar embodies Ibanez’s attention to detail, offering a professional performance and stunning tones to suit a variety of musical styles. Use the amp, strap, and cable to take your performance to the stage, or practice at home with the included headphones. Also containing a durable gig bag, picks, tuner, and accessories pouch, the Ibanez IJRG200 Jumpstart Pack lets you start practising and playing straight away. The Ibanez IJRG200 Jumpstart Pack is made to solve the common problem when starting to play a new instrument: it can be tricky to know where to start and what you'll need to buy. The Jumpstart Pack aims to help you on your path by giving you everything you need in one ready-to-rock bundle. Available in blue, black, and red colours, the Ibanez GRG guitar looks the part and is made to get you started on your guitar playing journey. Featuring an easy to play full size electric guitar, the Jumpstart Pack will ensure a smooth start to learning a new instrument. The guitar is similar in style to the Ibanez GRG140, but features two humbucking pickups for powerful tones. It also features a tremolo bridge system with tremolo arm to allow you to try out new tricks and playing techniques. The guitar has a basswood body and maple neck which gives an even tone and brightness alongside a comfortable feel with the contours of the body. The pickups can be accessed with the 3-way pickup selector to give 3 different tones to play with. The guitar looks the part and is designed to make practising as easy and as comfortable as possible. When you've developed your skills, the GRG electric guitar has enough features to allow you to play on stage. An essential part of learning the electric guitar is plugging into an amplifier and playing out loud. The IJRG200 Jumpstart Pack includes a 10W amplifier which allows you to shape your tone and experiment with distortion. When you're ready to gig, the amplifier is portable enough to make it to the stage and will allow you to be heard with your friends. 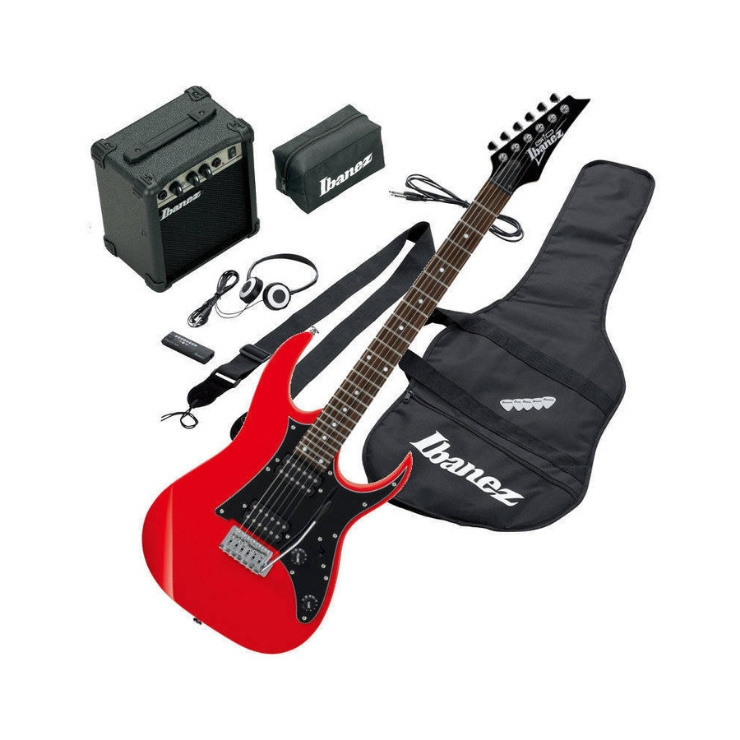 The Ibanez Jumpstart Pack includes everything you need to start playing and gigging. It includes a cable, electronic tuner, picks, guitar strap, gig bag, and accessories pouch. This means you can transport your guitar to and from school or the practice room, get tuned up, get plugged in, and store all your extra accessories and music with ease. A set of headphones are also included for those times when you want to practice silently.